On Wednesday,14 Oct 2018,there were severe confrontations in this unusual day between a group of revolutionaries and squads of Saudi army ,where they have used all kinds of weapons against the heavy populated areas. The raid had begun in the morning at 8 o'clock, as the mercenaries stormed "Bab al-Taweel" neighborhood by a large number of vehicles .The forces besieged all the entrances and exits of the area , where the bombardment and bullets voices were heard from far distance. 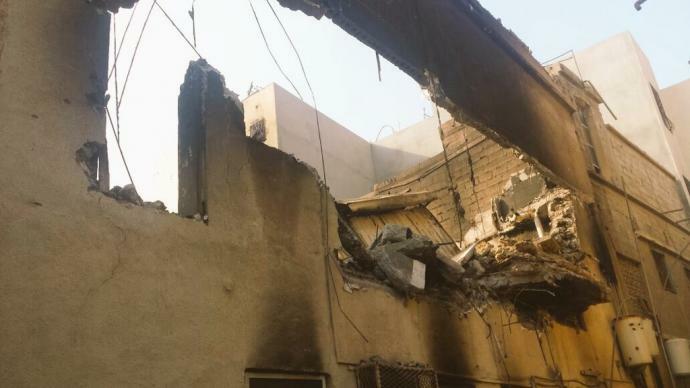 The Saudi forces intensified its attack during the night in an attempt to arrest the revolutionists or killing them without any consideration for the peaceful civilians whose houses were burned-out and many of them injured. The gangs did not get enough of horrifying, launching RPJs and random bullets on the houses, but they cut off power for Imam Ali (p),St and a number of houses to force the residents to displace from the besieged neighborhoods. They also assaulted a group of women and detained a whole family's members. Meanwhile, unassured reports have said that the patrol's commander "Omer al-Marhabi" has died and 3 soldiers killed, while the brave rebels were able to survive ,according to a statement issued by "Risistance in al-Qatif" group ,which mentioned the details of the confrontation a and the Husseini resistance.
" As they are trying to deceive you ,Allah shall protect you, and he is the only supporter of the believers " (al-Anfal, 62) . At 8.am on Wednesday, October17, 2018, corresponding 8, Safer 1440 H, the Saudi occupied forces had besieged a group of young believers in al-Qatif, "Bab al- Shamal neighborhood" for detaining them oppressively or killing them directly. The force which besieged the area had terrified the residents and civilians by shooting bullets and mortars randomly on the houses and by-passers . The attack had caused physical damage to the public property and the burning of several houses. The young men did not surrender to the oppressive force and they did not give up their hands like cowards. They resisted the regime's gangs with the available means with martyrdom' souls, fighting the most prominent battle despite the big difference between the two forces. The men of Allah who are resisting in the battlefields under the slogan "Supporting the oppressed " have met the call of duty and the jihadist and moral duty to help the besieged men , where an unbalanced fighting had been broken .The trapped men were rescued by the revolutionists and the confrontation had caused damages to the enemy's vehicles and the men of Allah went out safely and supported by Allah's dignity and protection.